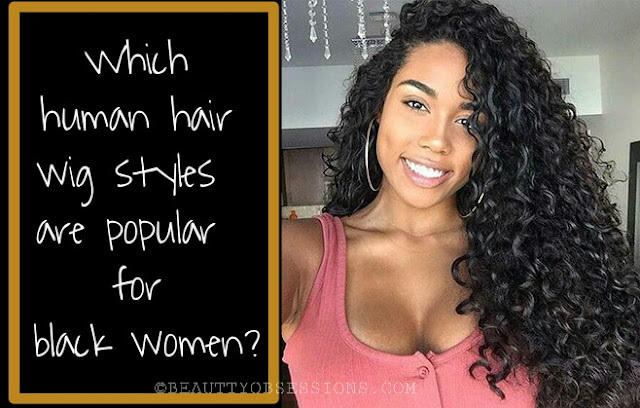 Which human hair wig styles are popular for black women? Most black women are born with natural thick beautiful hair texture which requires a lot of attention. As a black woman you know coconut oil and heat is your friend if you want to keep that thick beauty under control and truthfully it is not every day you are in the mood to give your hair that tender love and care it needs. Some days you just want to achieve a great look in minutes, this is why the human hair wigs market is becoming very popular. Human hair wigs were introduced into the market some few years ago and since then can be found in the homes of most black women. While the black thick hair is very beautiful, sometimes you just want a different look for the day and these human hair wigs can act as a protective shield for your black hair from chemicals and direct sunlight. There are so many types of human hair wigs ranging from human hair full lace wigs to half wigs and all these wigs are ideal for the average black woman. 1.Pixie human hair wigs style : Pixie human hair wigs style is a short wig style that gives you the feeling of a haircut without a visit to the barbershop. This hairstyle is popular among black women because it gives you freedom from your natural full thick hair and very appropriate during summer periods. You can feel the summer breeze on your neck and your face. 2.Wet and wavy full lace wigs style : Do not get confused here, black women love their big beautiful thick hair, but sometimes they just want to escape the hard work that makes it come out looking all lush and beautiful ( so next time you see a black women with her natural thick hair looking all fine, you better throw a compliment her way). This is why the wet and wavy full lace wigs is a favourite among black women. It is not only very soft but also the full lace closure gives it a natural flow. Wetting the hair reduces the waviness of the hair but if you want it notoriously full then a blow dryer is your friend. 3.Body wave human hair wigs: Black women have taken a liking to body wave human hair wigs especially the human full lace wigs because it does not only come in handy but it gives them the illusion of having a different hair than they are generally used to. Before you spot a black woman from afar with her hair even if when she is light skinned but now it is kind of hard to tell because human hair wigs and human hair full lace wigs in body wave gives them the opportunity to look different. Human wigs come in different styles ranging from straight to curly and body wave. They also come in different qualities and grades giving the black woman an opportunity to look good in a hurry. Black women seeking a certain hairstyle or colour can now achieve it.